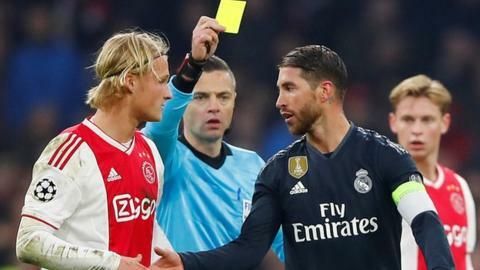 Real Madrid defender Sergio Ramos says he is "surprised" about the reaction to his yellow card against Ajax and the suggestion he earned it on purpose. Ramos fouled Kasper Dolberg in the 89th minute with Real leading 2-1, meaning he is suspended for their Champions League last-16 second-leg meeting. Uefa is investigating comments he made suggesting he was booked deliberately. Asked if he knew the foul was likely to lead to a yellow card and a ban, Ramos said: "Yes, but I had no choice." A suspension at this stage greatly reduces the risk of missing a match later in the competition, with all bookings wiped following the quarter-final stage. However, a player who purposely obtains a booking can be banned for two games. Uefa began its investigation after Ramos told reporters he would "be lying if I said I didn't force [the booking]" during Wednesday's game. But on Friday he clarified: "I'm very surprised about all this. I was referring to forcing the foul, a foul that was inevitable. Not to forcing the booking. "It was a very dangerous counter-attack in the 88th minute, with an open match and the tie as well. "That's why I said that I would lie if I said I did not know that I was carrying a penalty, just as I knew that I had no other choice than to make a mistake. And that's what I meant when I said that in football you have to make complicated decisions." Ramos added that, had he wanted to pick up a yellow card on purpose, he could have done so in a group game against Roma because "we were already classified as first" and the last game against CSKA "was inconsequential". Los Blancos secured a first-leg advantage against Ajax through Marco Asensio's goal two minutes before the controversial booking. "In a game there are many tensions, many sensations and many pulsations," Ramos tweeted. "You have to make decisions in seconds. The best of today is the result. The worst, not being able to be with my team-mates for a game." Ramos' team-mate Dani Carvajal received a two-game ban from Uefa when he was judged to have been booked on purpose in the final minute of a 6-0 win over Apoel Nicosia in last season's tournament. Ramos and former Real midfielder Xabi Alonso were both booked late on in a 3-0 quarter-final first-leg victory over Galatasaray in 2013.